Join the Hi5 photo shootout scheduled for October 28- November 5, 2018. 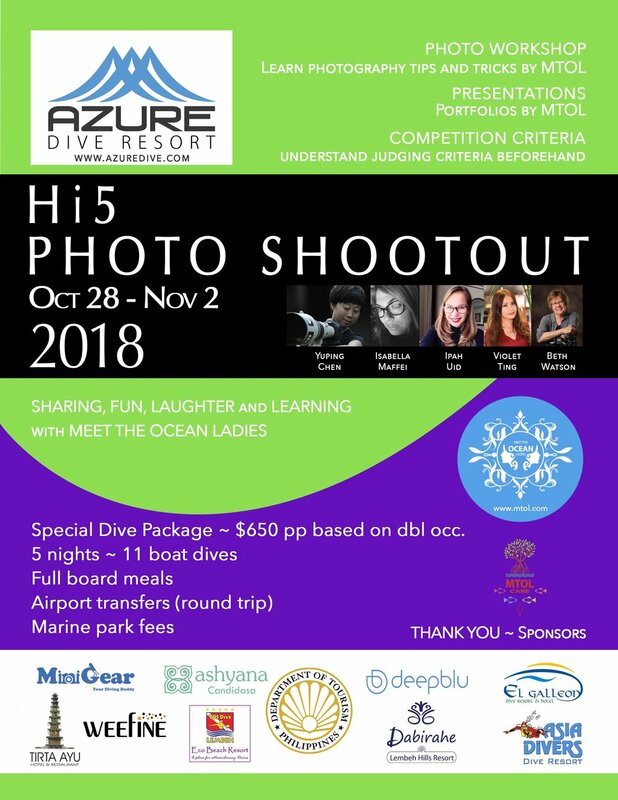 The event is organized in colloboration with Meet the Ocean Ladies (MTOL) and AZURE DIVE RESORT in Dauin, Philppines. The main concept of the shootout is to feature 5 species predominately found in the coastal waters of Dauin, Negros Oriental. In addition the members of Meet the Ocean Ladies will serve in the panel as judges of the competition. Thank you to all the contest /prize sponsors of the event! Looking forward to my first trip to Atmosphere Resort. It's going to be great! Thanks so much for hosting. Dive safari ~ Oslob-Sumilon, Apo Island, Alona Beach and Balicasag Island. Thanks so much for hosting. Very excited about visiting Anda, Bohol for the first time. Thank you very much Magic Oceans for hosting. This will be my first visit to Palau and I am very excited about this opportunity. Palau is an archipelago of over 500 islands, part of the Micronesia region in the Pacific Ocean. Thanks so much for hosting. Excited about returning to a favorite place. Lots of fun, laughter, friendship and great diving! Excited to be going back to the fun-fill, action-packed diving in Komodo, Indonesia. Diving the USESCO Heritage site in the Sulu Sea. Puerto Galera is a wonderful dive destination with great photo opportunities. Verde Island passage one of the main attractions here and it should not be missed. This region has the richest most biodiverse waters on the planet. 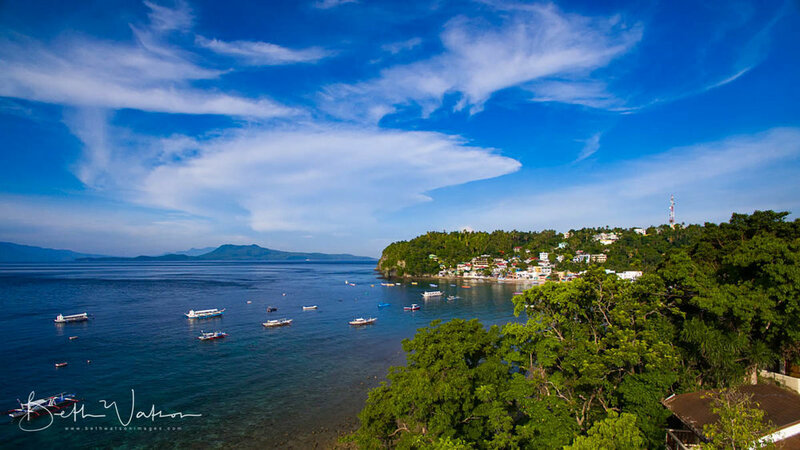 Sabang Bay with Verde Island in the background. My speaking slot will be on May 9th ... details to follow. Thanks to Dive Photo Guide and Deep Indonesia Photo Competition. 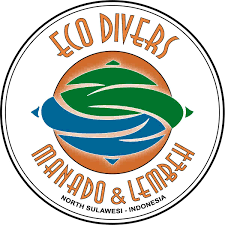 Thanks to Eco Divers for sponsoring such an amazing prize. Come join us for one or both events in Bali and Derawan. Ashyana Candidasa resort in Bali, Indonesia will be hosting the first MTOL event. Entries for the UW Photo Challenge opens in December. The final round will be a "live judging" and will be held at the DRT Show Malayasia in Februrary. It's an honor to be one of the judges for this competiton. Come join us as the DRT show in Malaysia! I am honored to bea a guest speaker at the show. Raja Ampat aboard the Indo Siren with the Asia Divers group from Puerto Galera, Philippines. Asia Divers is celebrating their 30th Anniversary and I am very excited to take part in the festivities. Very excited about diving the waters of Komodo, Indonesia aboard the beautiful Arenui. Excited to be visiting PG again this year in July. It's a wonderful destination, one of my favorites. 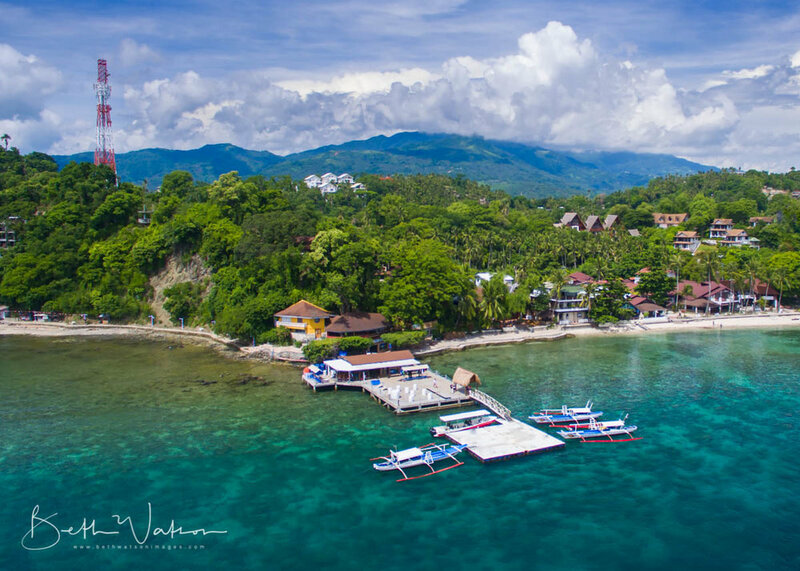 Proud to be the in-house guest photographer at Anilao Photo Academy the month of June! Another event is coming up in the month of February 2017. We are very proud to host some of the finest Female Underwater Photographers here at Dabirahe @ Lembeh Hills - Lembeh, Indonesia. Be part of this, as it is a great opportunity to meet and dive together with them. You might have a chance to learn a few tips-and-tricks of excellent underwater photography techniques. Check out the awesome line-up of guest speakers for the Singapore show! Very honored to be a invited guest speaker at the DRT Show Singapore in February 2017. Hope to see many of you there. I will be giving two presentations: "Shooting Wide Angle: A Path to Freedom" and "The Photographer's Friends: Breathing, Buoyancy & Bubbles". Scheduled speaking times will be posted closer to the event. Very excited about traveling to the Socorro Island aboard the Rocio Del Mar Mar . It's a great opportunity to have awesome encounters with schooling hammerheads, white tip sharks, silver tips, silkies, threshers, galapagos and giant oceanic mantas. 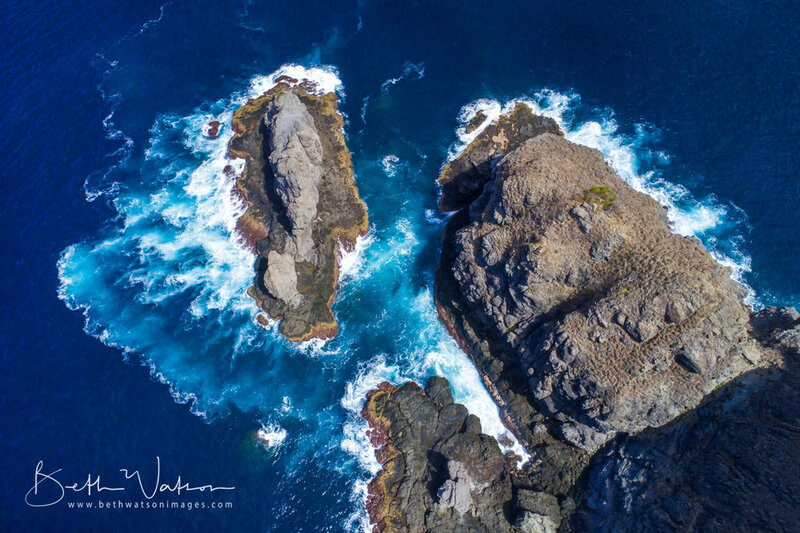 The Socorro Islands are located in the eastern Pacific Ocean approximately 250 miles south of Cabo San Lucas, Mexico - at the tip of the Baja peninsula. Very honored to a judge in the 5th Asia Pacific Underwater Photo Challenge 2017! Submit your best underwater photos and win the prize! Top 3 will be announced after live judging at the DRT Show Singapore 2017. Very honored to be a invited guest speaker at the DRT Show Philippines in Sept.